Geneva, Switzerland, 16 February 2017 – Energy is central to nearly every major challenge and opportunity the world faces. However, one fifth of the world population still lacks access to energy and 3 billion people rely on wood, coal or animal waste for cooking and heating. Today, sustainable energy and climate change are big global concerns. The interconnection of grids would open up an unprecedented opportunity to globally share the resources of the whole planet, bringing clean energy to everybody, everywhere in the world. Global energy interconnection (GEI) is technically highly complex. It will require a level of dependability never seen before. International Standards inherently contain solutions that will help pre-address this complexity and they will play a crucial role in mastering dependability upfront. This White Paper aims to assess the worldwide needs, benefits, policies and preconditions for GEI. It examines the readiness of potential markets and identifies technical and business trends as well as hurdles. The White Paper analyzes and compares several global transmission scenarios and evaluates their impact on energy supply, the environment, technologies, and policies, as well as standards development. Last but not least, this White Paper will provide recommendations on how standardization for such a large system of systems will need to be conducted and which stakeholders have to be involved. 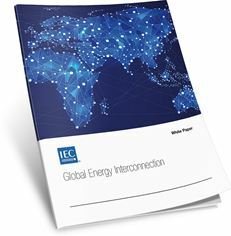 This White Paper was developed by the IEC Market Strategy Board (MSB) with major contributions from the International Energy Agency (IEA) and State Grid Corporation of China (SGCC). The IEC (International Electrotechnical Commission) is the world’s leading organization that prepares and publishes globally relevant International Standards for all electric and electronic devices and systems. It brings together 171 countries, representing 99.1% of the world population and 99.2% of world electricity generation. More than 20 000 experts cooperate on the global IEC platform and many more in each member country. They ensure that products work everywhere safely and efficiently with each other. The IEC also supports all forms of conformity assessment and administers four Conformity Assessment Systems that certify that components, equipment and systems used in homes, offices, healthcare facilities, public spaces, transportation, manufacturing, explosive environments and during energy generation conform to them. IEC work covers a vast range of technologies: power generation (including all renewable energy sources), transmission, distribution, Smart Grid & Smart Cities, batteries, home appliances, office and medical equipment, all public and private transportation, semiconductors, fibre optics, nanotechnology, multimedia, information technology, and more. It also addresses safety, EMC, performance and the environment. The IEA (International Energy Agency) is an autonomous organisation which works to ensure reliable, affordable and clean energy for its 29 member countries and beyond. The IEA has four main areas of focus: energy security, economic development, environmental awareness and engagement worldwide. Founded in 1974, the IEA was initially designed to help countries coordinate a collective response to major disruptions in the supply of oil, such as during the crisis of 1973-1974. While this remains a key aspect of its work, the IEA has evolved and expanded. It is at the heart of global dialogue on energy, providing authoritative statistics and analysis. An autonomous organisation, the IEA examines the full spectrum of energy issues and advocates policies that will enhance the reliability, affordability and sustainability of energy in its 29 member countries and beyond. SGCC (State Grid Corporation of China) was established on December 29, 2002, an enterprise approved by the State Council to carry out state-authorized investment and a pilot state holding company. It has been rated as an A-Class enterprise by SASAC evaluation on operation performances for 11 consecutive years. As the largest utility in the world, SGCC has a stable ranking of the 2nd on Fortune Global 500.